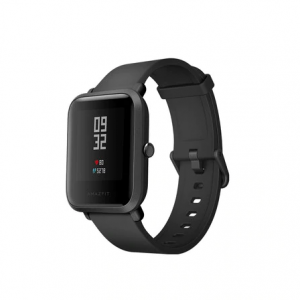 How to Sign Up on Aliexpress.com? 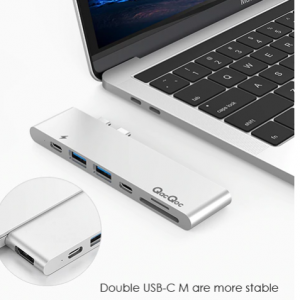 So, like many active Internet users, you have decided to make profitable purchases online on the Chinese website Aliexpress. Registration on Aliexpress.com it is absolutely no different from the registration on other online stores, it is absolutely free, standard and simple. For successful registration, you will need email and Internet access. The process from the beginning of reading this article and parallel registration to Aliexpress will take you a couple of minutes. Open the official registration page Aliexpress.com. 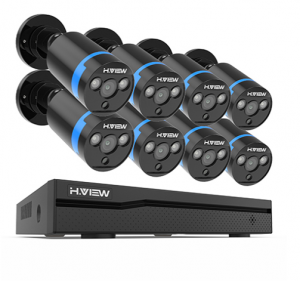 Click on the link to open a new window on the Official registration page on the site Aliexpress.com. 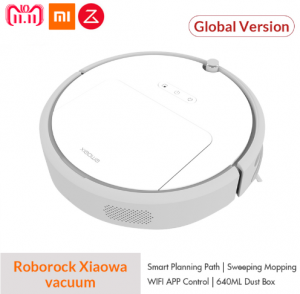 Or visit the site aliexpress.com and in the upper right corner there is a choice of “Delivery” – select the country of delivery, language, then click “Save”. Then just below to “Sign In” or “Sign Up”. Click on “Sign Up” link. If you have done everything correctly, the registration form will open. 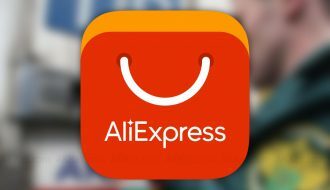 You can register on the aliexpress.com in two ways: the first way is quickly by through social networks Facebook or Google+ and the second way to register by standard filling out the registration form. These two methods will be discussed in detail on this page. 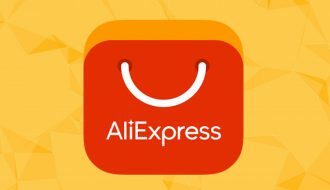 If you register on Aliexpress for the first time you can get a coupon for $4 for any types of purchases! You can register using your account on facebook.com or Google+. In the upper right corner of the website aliexpress.com press enter and choose the icon for Facebook or Google+. A window will open where you can confirm your access by clicking on “Sign In by Facebook to use your account in the AliExpress”. 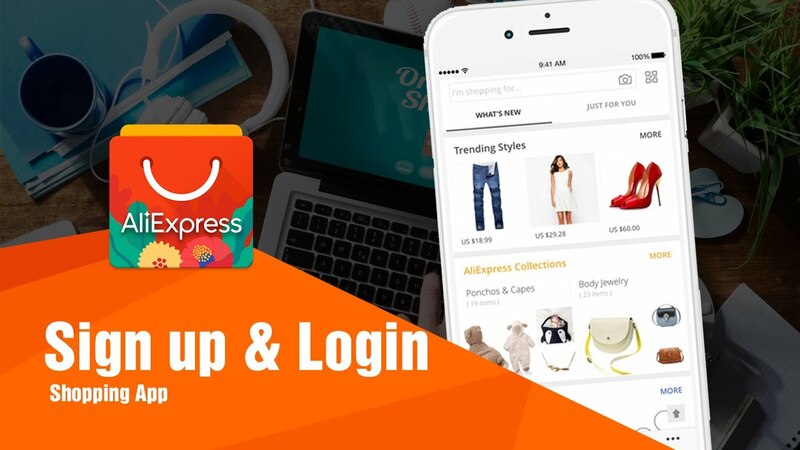 After login AliExpress App you will receive the following information: public profile (profile photo, age, gender and other public information) and email. Remember that “your personal data, your friend’s list and your photos will be available to the Application”. 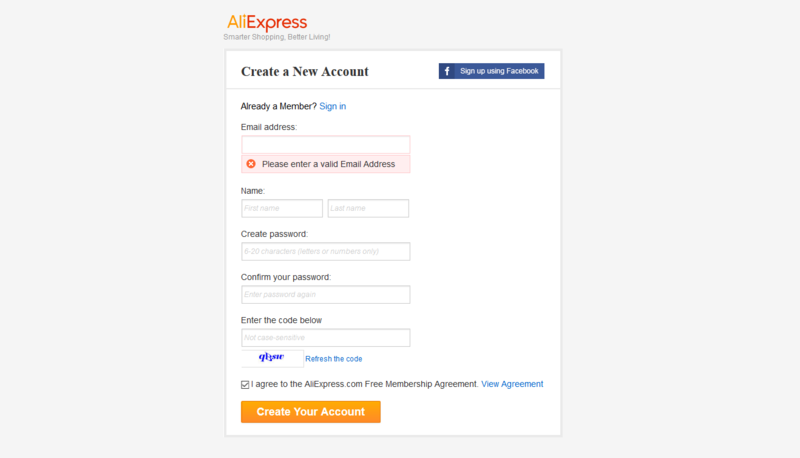 The Second Method of Registration on Aliexpress (Main). The second method of registration aliexpress.com by entering information on a special page, filling out the form. Enter the information on English (Latin letters). Fill in the columns “First Name” and “Last Name”. Come up and enter a password. The password must be at least 6 characters. Do not use numbers in a row, come up with a strong enough password. And write it down or remember! In case of loss of password to access the site aliexpress.com, it will be possible to restore by email. The password to the email you also must always remember! On the next line, you must enter the same password again to avoid an input error. Enter the captcha from the picture: letters and numbers. If you don’t see the characters well, click “Update” link. The information filled in earlier will remain, only the picture will be updated. Confirm free membership on AliExpress. If you want to read the agreement in English on the provision of free membership. Click on the big yellow button “Create Your Account”. Now it’s time to check the email that you entered when filling out the registration form and find a letter from Aliexpress with a greeting and a link to confirm your registration. If you can’t find this email, try looking in “Spam” folder or search for emails by typing in the word aliexpress.com. It is necessary to confirm the registration within 3 days, otherwise, the link in the letter will not be valid. 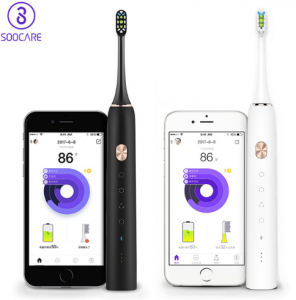 After clicking on the link you will find a greeting about the successful verification, your account is confirmed and you can go to your office on Aliexpress, choose products, participate in promotions and sales, make purchases and monitor the status of the order. Congratulations! You have successfully registered on Aliexpress! Have a good shopping! It is impossible to use all functions without registration on Aliexpress. Registration is mandatory for purchases. Posted in Guides•Tagged Aliexpress, How to Sign Up, Sign Up, Step by Step Guide•Leave a Comment on How to Sign Up on Aliexpress.com?